Doug and I don’t “budget”. Don’t get me wrong, we are very responsible. We are great savers. We don’t just buy things on a whim, and we do have a pretty good mindset with the occasional whiskey/beer/wine purchase. Essentials people. Essentials. We decided we were going to follow in the footsteps of our good friends and do what we are calling a finance purge. Spend nothing for a month. Besides groceries and bills. We gave each other forty dollars for what ever this month. Coffee, tea, lunch out,wine.. Whatever. Day one was yesterday. I can’t help but laugh when I tell you how much we had to spend. Doug bought a new/used truck that needed plates, tax etc. Of course it also needed the first car payment( first one for us in over ten years). Then, the dryer broke. So over a grand later. Dryer still broke. Plates on. Today is a new day. 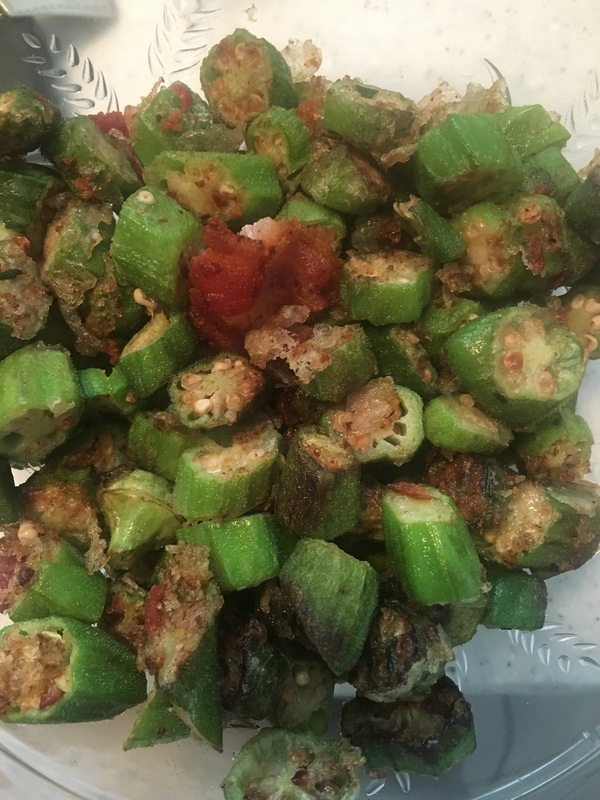 I made some bacon, and then in the hot bacon fat I added rosemary and fried up some okra. I also made some cold brew coffee, and basil/peach sorbet. I’d say today is looking up and lower in the budget. So if I say no to you this month, please do not think it must be you. It might be–but really, I just can’t spend money. We could go for a walk or hold hands. You could always come over for dinner. Seriously. Bring wine. I used Cafe Bustelo from Aldi, water and a jar. I followed a little bit of what pioneer woman does. I added 1/2 cup plus 2 tbsp of the ground espresso to 44oz of water. Put it in the fridge in a glass jar overnight. Then I sift it in a tea strainer. I have a super fine mesh one. You will need this or cheesecloth. 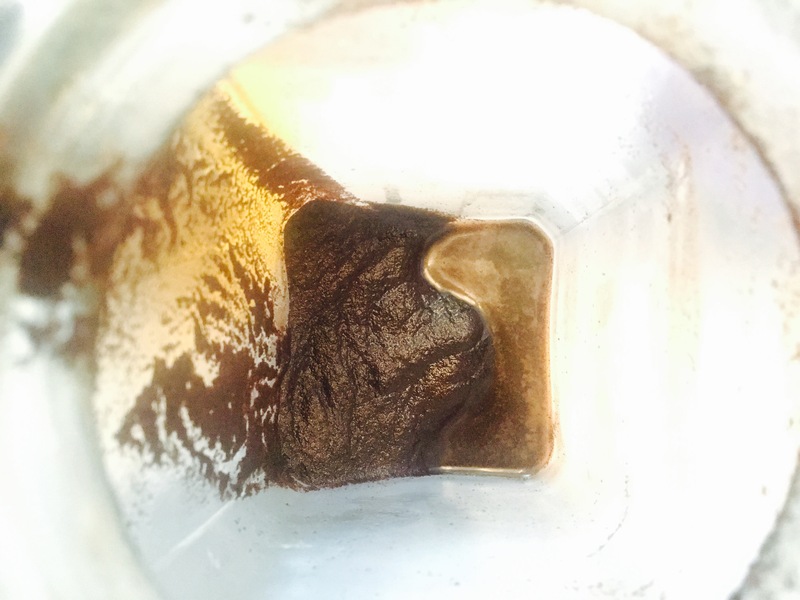 I filtered, then put into a clean jar and placed back in the fridge for liquid courage later when I want to make a purchase on Amazon. Then I took a picture of the grounds because they looked cool. 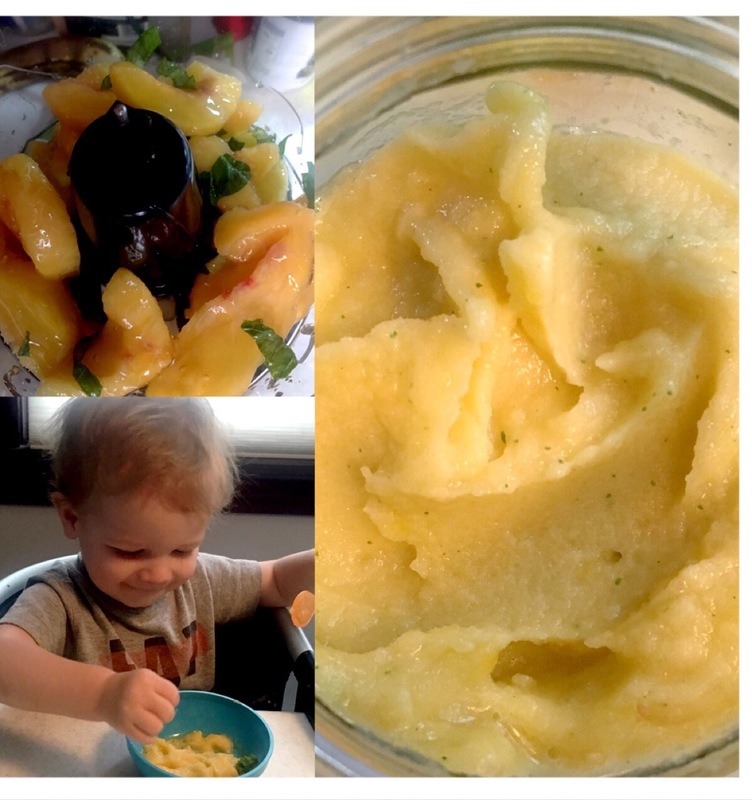 One small bag of frozen peaches, 1/2 cup of honey, squeeze of lemon, one basil leaf (chopped) and 1/2- 1 cup of water. Place all ingredients into a food processor. Add more water if needed. Blend to perfection. Serve on side of a cutie pie.